Kindergarten is a quarter gone. We had our parent/teacher conferences yesterday. It’s still well over 100 degrees — heck, it’s barely October — so it just doesn’t feel right to call the semester half in the can. But it is. Sophie is halfway done with her first half of kindergarten. And Annabelle’s half done with the first half of second grade. Ray and I beamed through her conference — she’s a little above grade level for reading and right at grade level for math, and her teacher, Mrs. Z., adores her. The feeling’s mutual; Annabelle practically melts when she hears Mrs. Z’s name. I grilled Mrs. Z about mean girl stuff and whether AB’s a nag (no and no) and we talked about Annabelle’s morning ritual. Before Sophie came to school with Annabelle, AB had us all to herself. Ray or I would drive both girls to the end of the block, put Sophie on the school bus (the pre-school insisted, and it was a cush ride — just Sophie and one or two other kids, and she had her own car seat) then drive AB to school, where we’d have a few minutes of one-on-one before the bell rang. That’s over this year. This year we’re juggling both girls, and while Sophie’s much better than she was a few weeks ago, from the moment we step out of the car she has to be encouraged to stay on the straight and narrow. I have to leave Annabelle to put her own backpack on, while I make sure Sophie doesn’t run into traffic. We have to pause when Sophie refuses to relinquish the crossing guard’s hand. And we usually have to chase Sophie in one direction (out to the playground) or another (away from the older kids’ classrooms). Annabelle’s old enough to line up with her classmates when the first bell rings — and most mornings she does — but she’d rather I stay by her side and walk in with the line. I try, but most days I’m corraling Sophie into her own classroom. And so we have developed a ritual. Annabelle stands outside her classroom, waiting for one last hug. “Once she has that hug, she’s fine,” Mrs. Z. assured us yesterday. She thinks it’s sweet. So do I, though I see it as a sign of my own neurotic tendencies, lurking. I was eager to get a look at Sophie’s report card. I have to admit that I was a little startled to see a couple of “N”s for “needs improvement”. 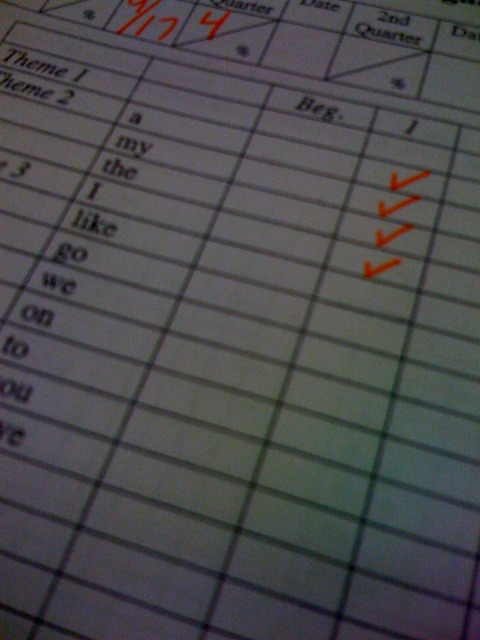 I’m thinking back, and I’m not sure I’ve ever seen an “N” on a report card. Not on one of mine (in third grade, I did get an S minus — S is for satifactory, the minus was NOT — for handwriting, which pissed me off so much I cleaned up my act immediately) and not on one of Annabelle’s. Ms. X pulled out a looseleaf binder, and flipped through Sophie’s section. She showed us that Sophie has, indeed, mastered every one of her sounds. “And she’s really not the last one to do it?” I asked (I asked AGAIN, I’m geting annoying, I know, but I had to hear it). 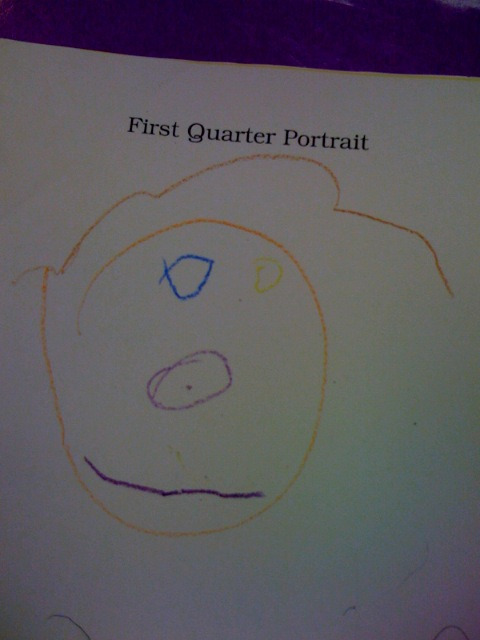 She got an “S” for writing her first name, and Ms. X assured us she’s stopped drawing on other kids’ papers. The PE teacher reports that the kids are “mother henning” her less and interacting with her more as friends. Of course I sat there wondering what Ms. X isn’t telling us, though I hear from her nearly every day. (Again, my neurotic tendencies.) I know things are far from perfect. On Monday morning, Annabelle tripped on the playground before school. Of course she was standing right in front of me when it happened. (Don’t you love being there to witness your kids’ injuries?!) I grabbed her hand, then Sophie’s, and started marching to the nurse’s office. It wound up being close to nothing, but Annabelle did get a bloody lip, which startled both Sophie and me. Halfway to the nurse, we passed two good mom friends; they agreed to walk Sophie to class. “I’ll be back to say goodbye!” I called to Sophie as I hustled Annabelle away. In the nurse’s office, Annabelle was washed and Band Aided. The bell rang. A few moments later, I heard the quietest knock possible on the door. It took me a minute to even realize what it was. I opened the door, and there was Sophie. She marched in the door and walked directly to Annabelle, giving her a hug and examining her wounds. Before I’d had time to react, the door swung open and in walked Ms. X. In some ways, Sophie’s actions were totally appropriate. She was worried about her sister. But they were also completely unsafe. 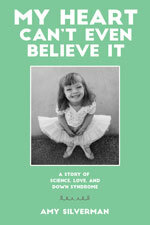 Ms. X assured us yesterday that Sophie’s not the only kid in the class with challenges — far from it she said, laughing. But of course I worry. Ray hadn’t seen the bulletin board with Dan the Flying Man. I haven’t read the book, but I’m guessing Dan is a character who flies. 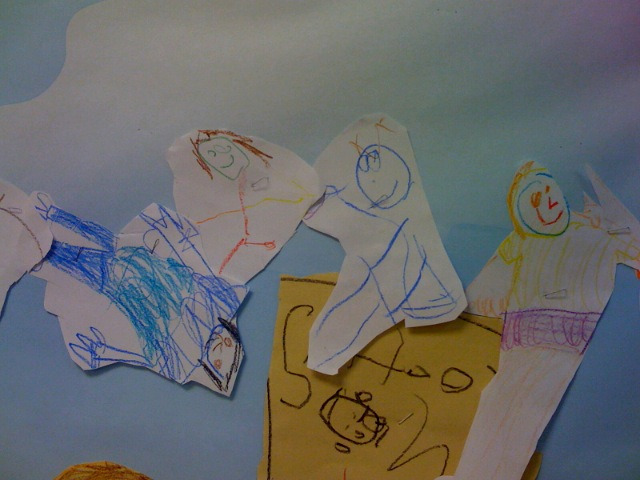 Ms. X asked each of the kids to draw themselves flying, and stapled them up in a line. 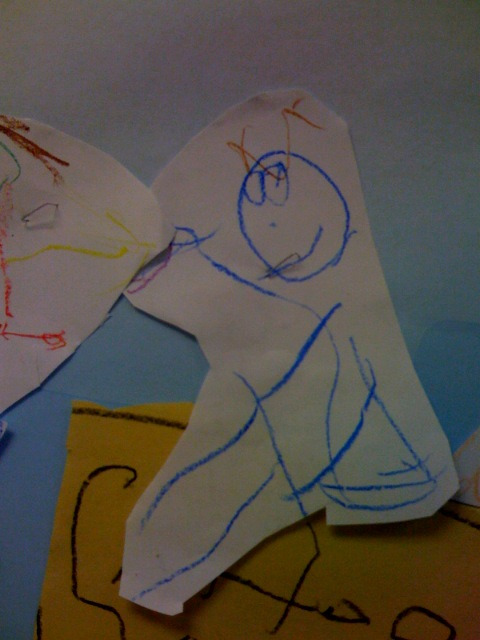 Ms. X pointed out Sophie’s flying figure — a happy blue shape, not as complex as the others’, but way better than she would have done in July, that’s for sure. And my favorite part is that she’s up there flying with her classmates, keeping up. She looks pretty good. I’m launching a new website about DS and would like to include stories of people who have kids with DS. If you’d like to submit your story, have me link to your story, or have any questions please email me. How cute…it almost looks like Sally Field with her Flying Nun habit or whatever you call that headpiece. The smile looks very coquettish!